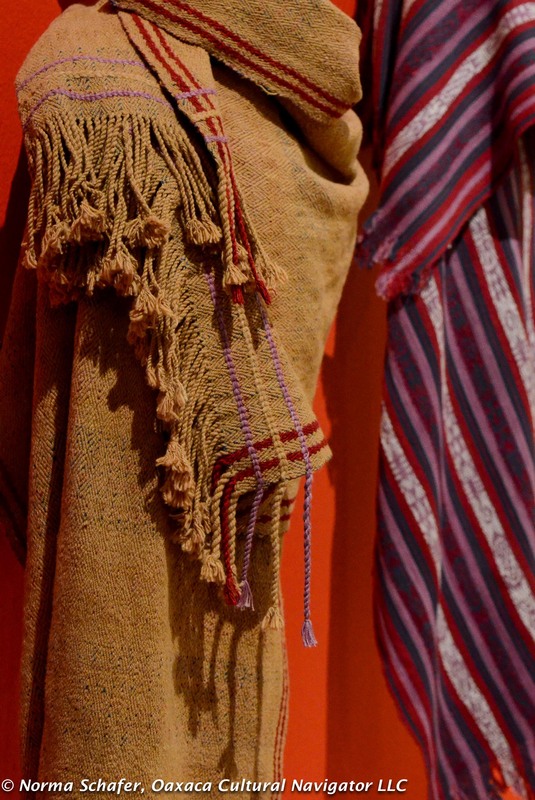 Getting to see this exhibit El Rebozo Made in Mexico before it closes Sunday, August 30, 2015, has been a priority for me since I first heard about the planning for it several years ago from British fashion designer-textile artist Hilary Simon. I scheduled this Mexico City stopover of two days before returning to the U.S. just for this purpose. 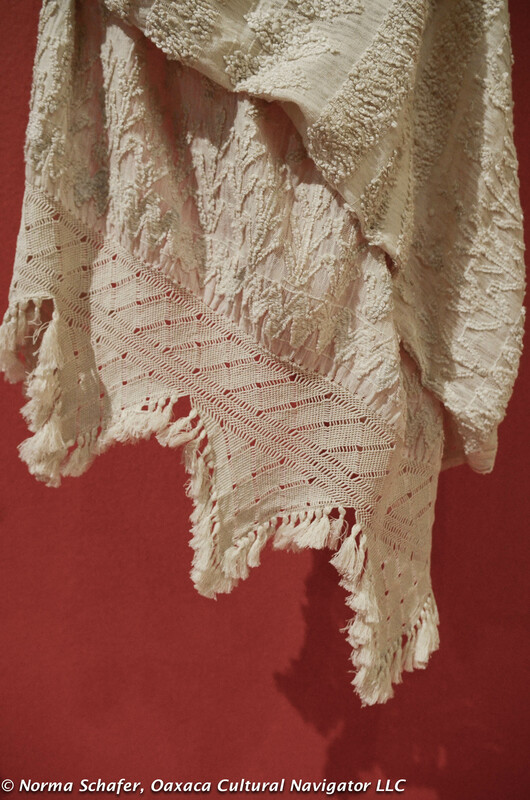 The rebozo, or shawl, is a symbol of Mexico’s cultural identity. 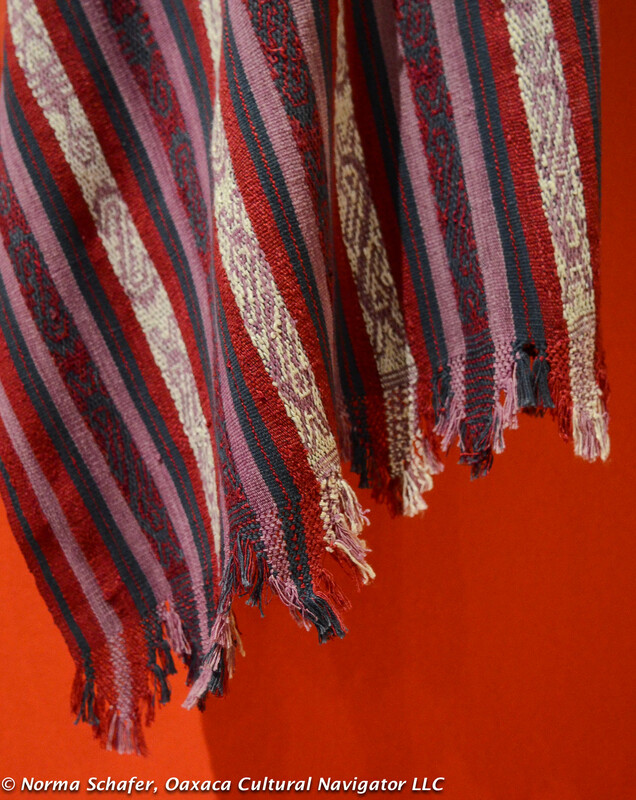 Textile regions throughout the country have designed and woven these rebozos according to local custom. Some are woven on a back strap loom, others on a pedal loom by women and men who learned at the feet of their parents and grandparents. Some are finished off with elaborate macrame hand-tied fringes that can be as longs as twelve or eighteen inches. 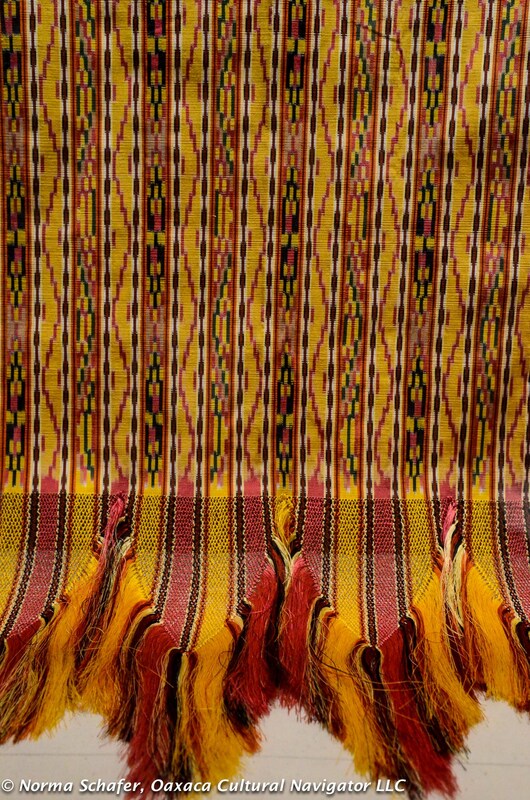 Some are plain weave and others are Mexican ikat or jaspe from the Tenancingo in the State of Mexico or Santa Maria del Rio in the State of San Luis Potosi. The one above is hand embroidered from the Isthmus of Tehuantepec. Fibers vary, too. There is silk, a mix of silk and cotton, rayon or artecel that is called “seda” (silk) here in Mexico, plus wool. The type of material, gauge of the thread and density of weave depends on the climate in each location. 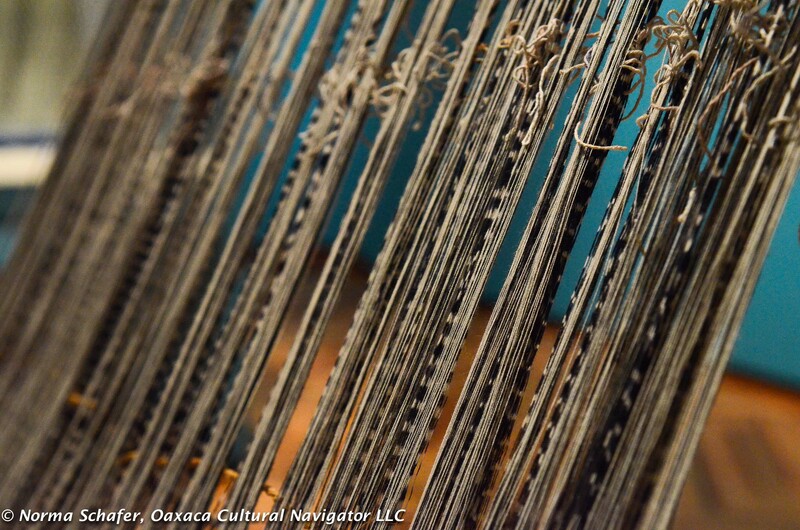 In pre-Columbian times, indigenous people cultivated coyuchi or wild cotton that is a beautiful caramel color, using it to weave garments, including rebozos. In the mountains above Oaxaca in a village called San Pedro Cajonos, they cultivate a wild silk the color of straw from a local worm, spinning it with a drop spindle. 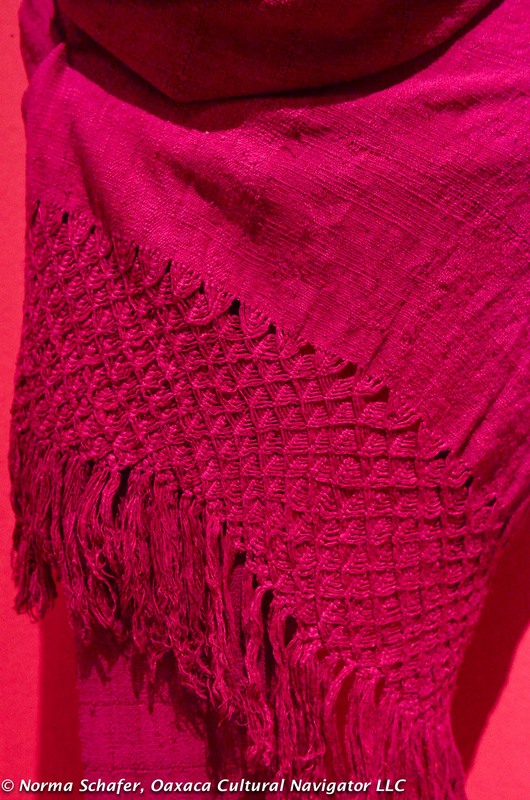 Below is the red silk rebozo dyed with cochineal by Moises Martinez, part of Lila Downs‘ collection. Local dyes were derived from indigo, wild marigold, nuts, mosses, tree bark. They used the caracol purpura snail found along the southern coast of Oaxaca to dye purple and the miniscule cochineal beetle, a parasite that lives on the prickly pear cactus paddle, for an intense, color-fast red. 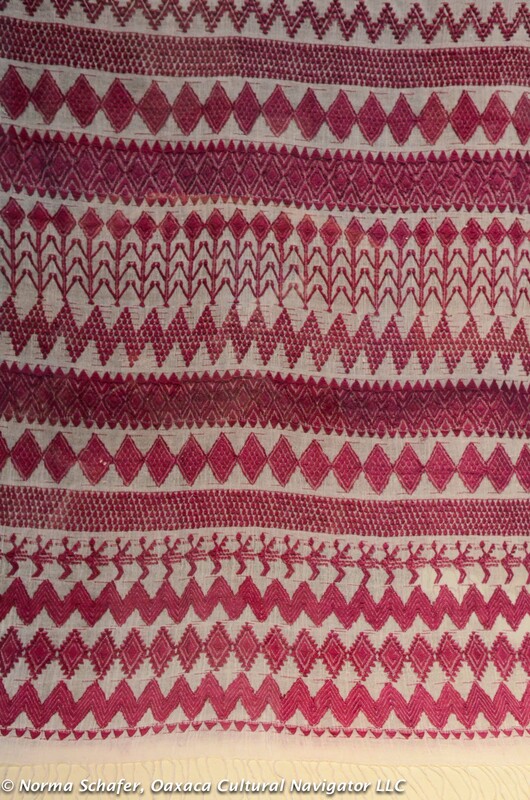 Feathers dyed red with cochineal were often woven into the fibers for embellishments. All these techniques and materials are still used today and are part of the exhibition. 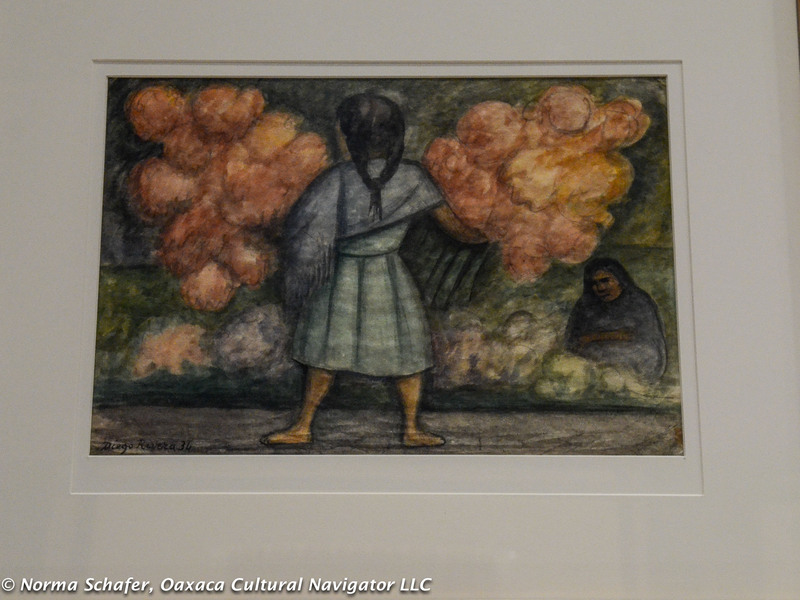 The State of Oaxaca is well-represented in this exhibit. 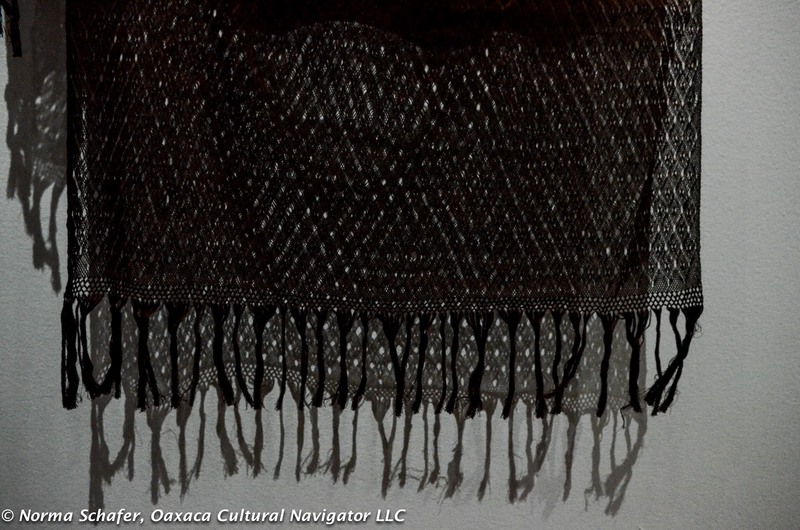 Many of the rebozos on display are part of the personal collections of Oaxaqueños and its institutions: Remigio Mestas Revilla, Mauricio Cervantes, Lila Downs, Trine Ellitsgaaard, Maddalena Forcella and The Museo Textil de Oaxaca. 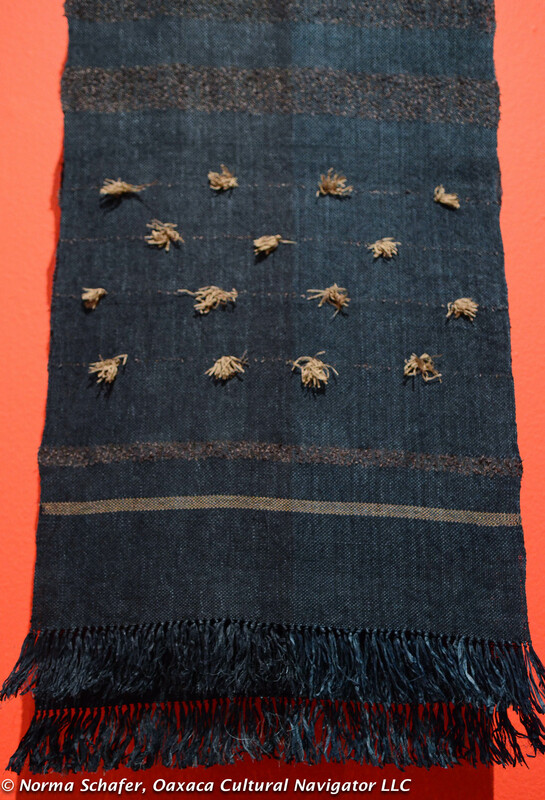 A black scented burial rebozo (above) woven in Tenancingo, part of Maurico Cervantes’ collection, displays an ancient Mexican tradition that is at risk of extinction because it is so labor intensive to make. Western fashion is dominating the tastes driven by a young, hip population. It is a completely manual process that takes months to complete. When you think of the rarity of the raw materials and the time commitment involved to complete a piece, it is no wonder that many command prices of up to $2,000 USD each. 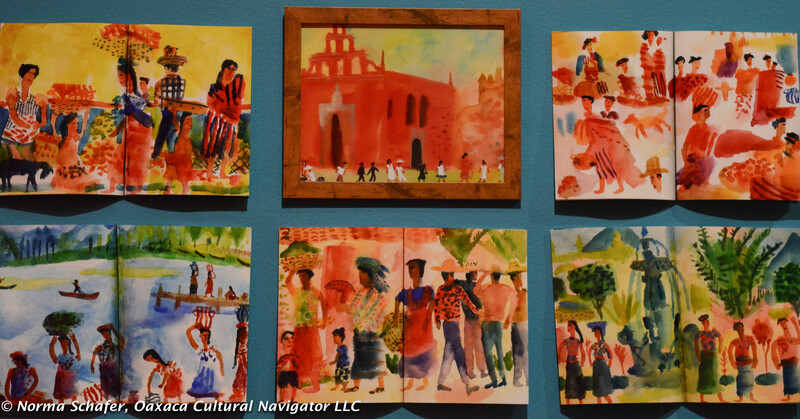 No Mexican exhibition would be complete without a reference to beloved Frida Kahlo. 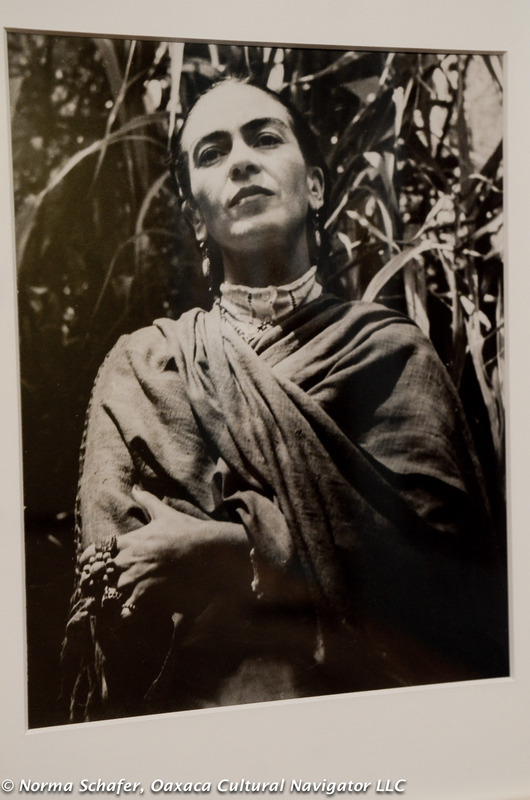 Above, left, is a photograph of a rebozo from her personal collection taken at Casa Azul by Pablo Aguinaco. To the right is a photographic portrait from 1951, just three years before her death at age 47. 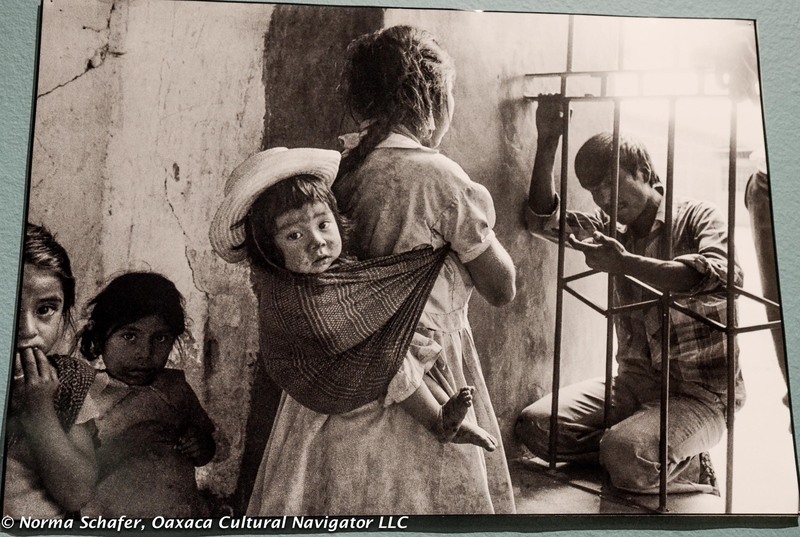 Other iconic images in the exhibition are this Diego Rivera painting, Vendadora de Flores, painted in 1934 (above), and this compelling photograph (below) by Pedro Valtiera taken in Oaxaca, 1974. I wanted to see the best of the best in preparation for a textile trip I’m taking to Tenancingo in September to the rebozo fair. 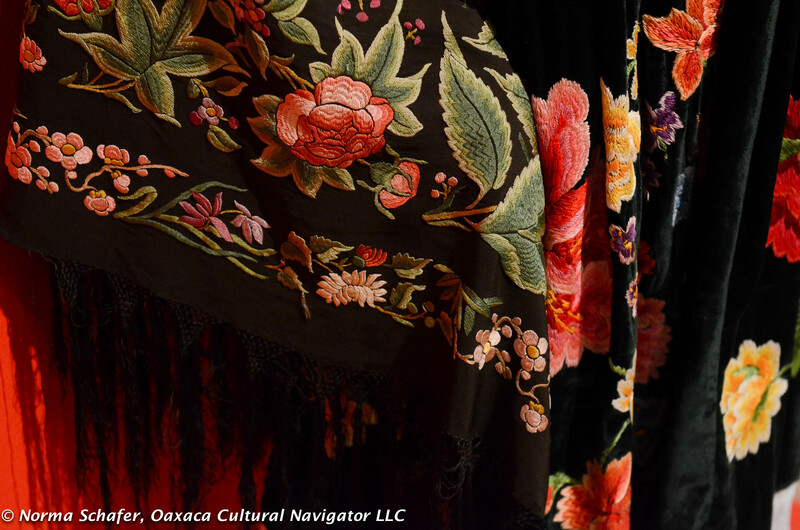 Going to the exhibit is part of my continuing education to know even more about Mexico’s textile culture and the importance of garment for cultural identity and continuity. 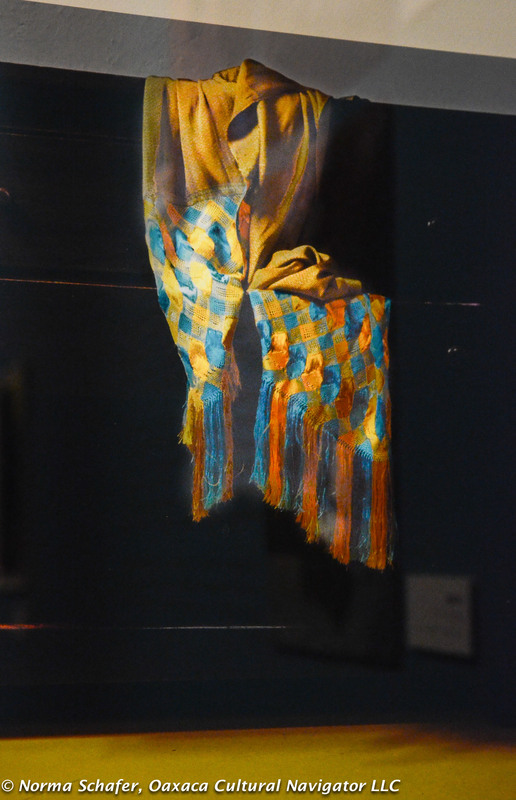 In addition to the textiles, the exhibit integrates old and new photographs, paintings, mixed media art work, memorabilia and related folk art. 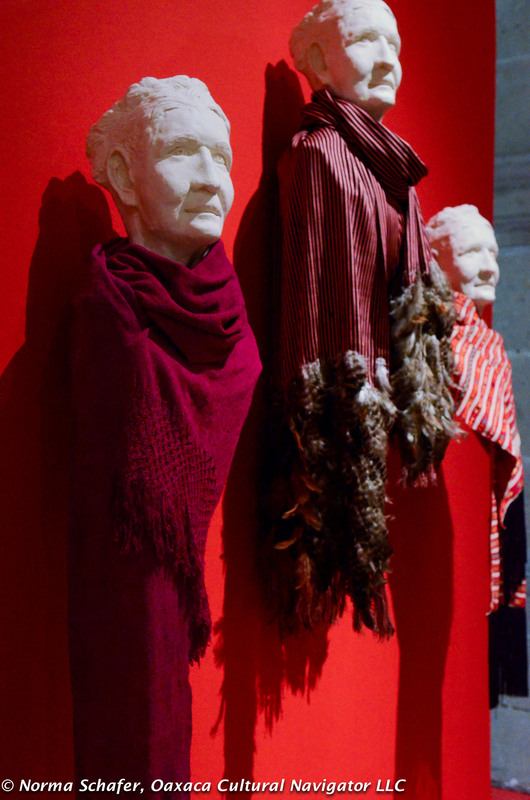 Above left is the felted wool and silk rebozo with cochineal stripe by Maddalena Forcella, titled Rebozo de Sangre, made in 2014. 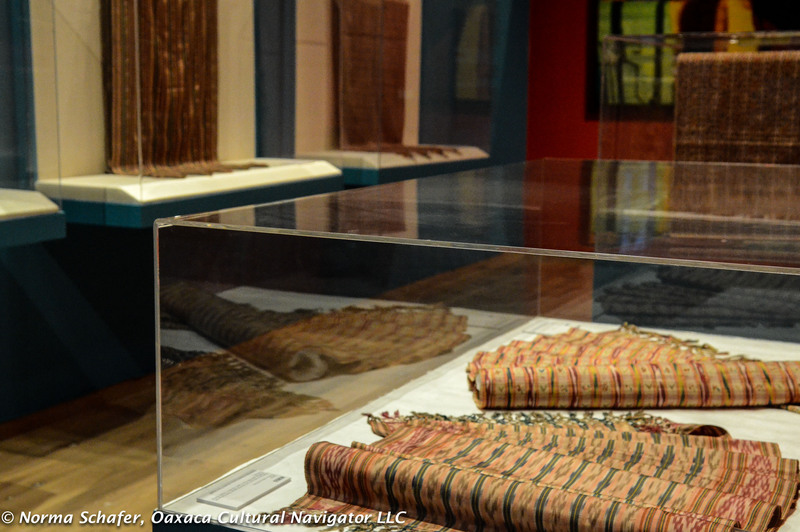 Above right is a handmade paper rebozo designed and constructed by Oaxaca textile artist Trine Ellitsgaard. 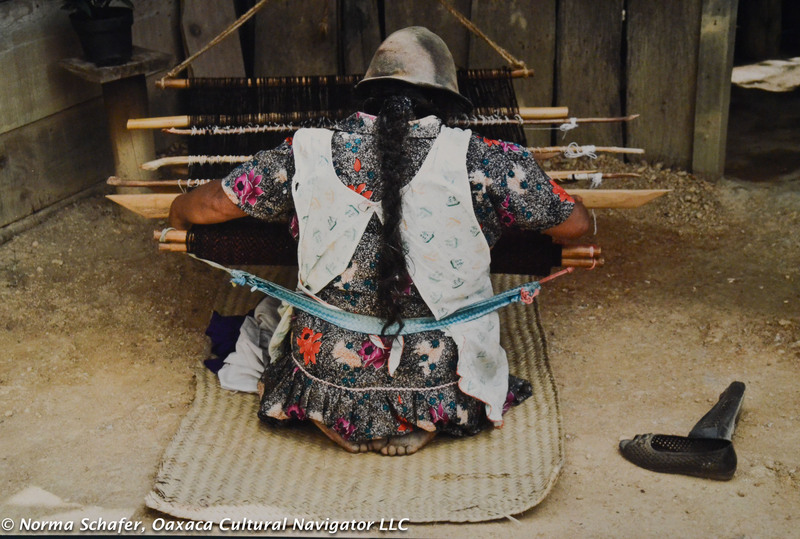 Photographer Tom Feher, who lives in Oaxaca with his wife Jo-Ann during the winter months, is represented with photos he took of the Miramar, Oaxaca women’s cooperative (above) for his book, Weaving Cultures, Weaving Lives: A Circle of Women. 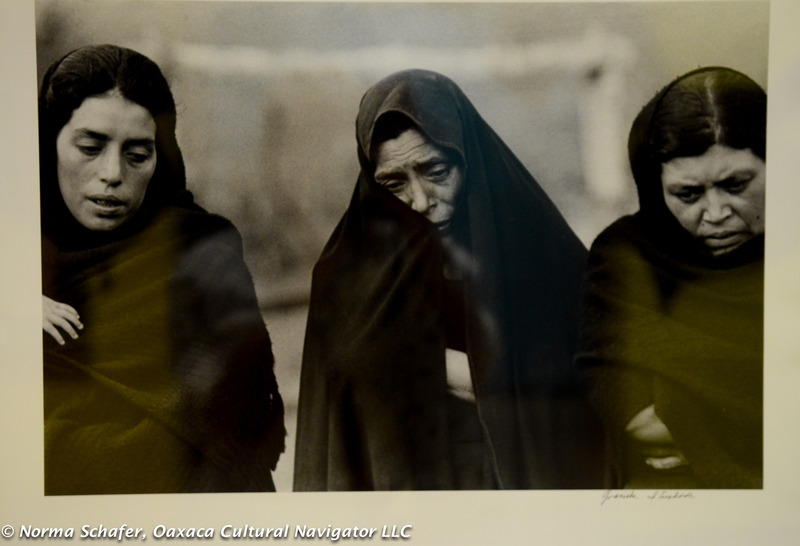 Oaxaca photographers Antonio Turok and Mari Seder also have pieces in the show. 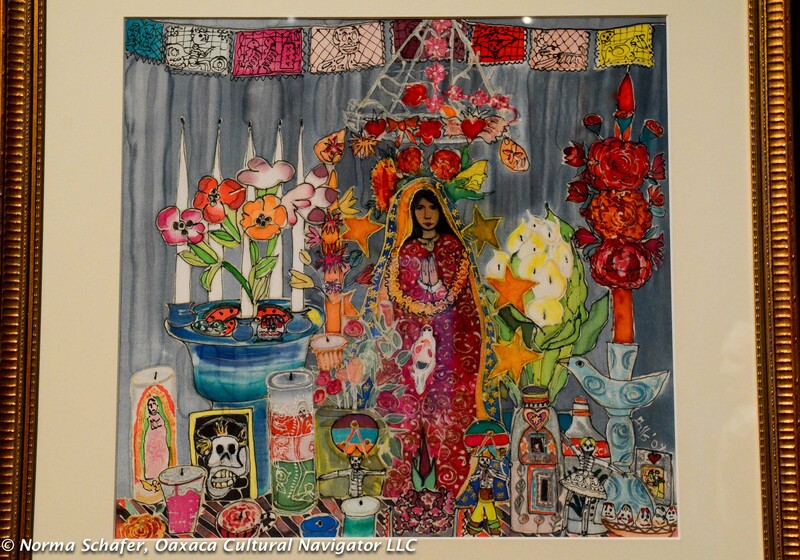 I loved Hilary Simon‘s Mi Altar Mexicano (above) and a series of watercolors (below) that Christopher Corr painted in 2000, all capturing the rebozo and the women who wear them. Rebozos have so many uses. They carry babies and bundles. They are wrapped like a crown to balance a basket filled with fruit or tamales or flowers. They are folded and put atop the head for sun protection. They protect shoulders from the evening chill. They cover the breast as baby takes nourishment. They are the embodiment of Mexican life. 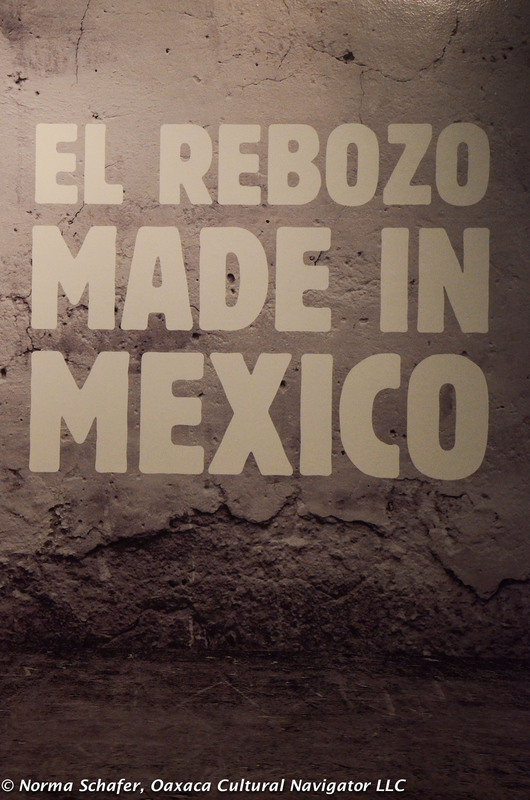 El Rebozo Made in Mexico is at the Franz Mayer Museum, Hidalgo 45, Cuauhtemoc, Centrol Historico in Mexico City. Tel: 55 5518 2266. Open daily, 9 a.m. to 5 p.m., except Monday. Hours can change, so call ahead to make sure they are open when you can be there. 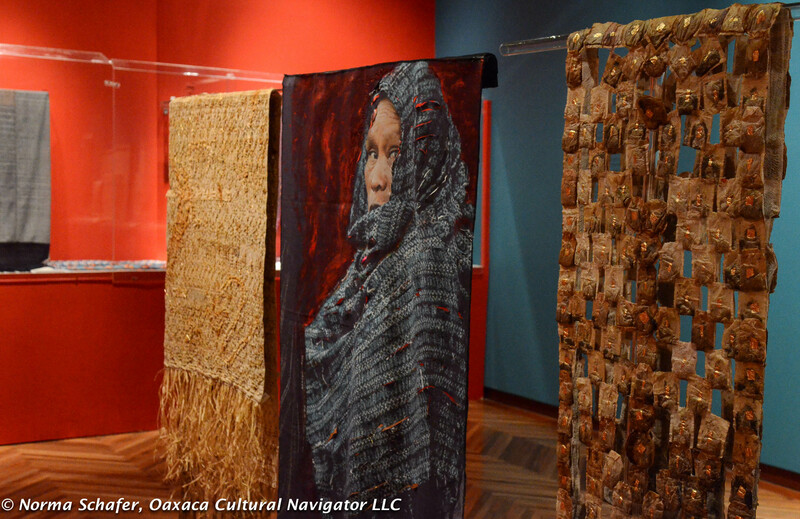 This entry was posted in Clothing Design, Cultural Commentary, Mexico City, Mixed Media Art, Photography, Textiles, Tapestries & Weaving, Travel & Tourism and tagged art, exhibition, Franz Mayer Museum, Mexico, Mexico City, natural dyes, Oaxaca, rebozo, shawl, show, weaving. Bookmark the permalink. Hi Norma – Was a catalogue published for this wonderful exhibition? Margaret, no there wasn’t a catalog, unfortunately, which is why I took so many photos. I would have bought one! We had hoped to go for the VIP opening, but it was too close to I have a Name in St. Paul. Several of Tom’s photographs are in the show. We are back in Oaxaca Oct. 17 . Look forward to getting together. 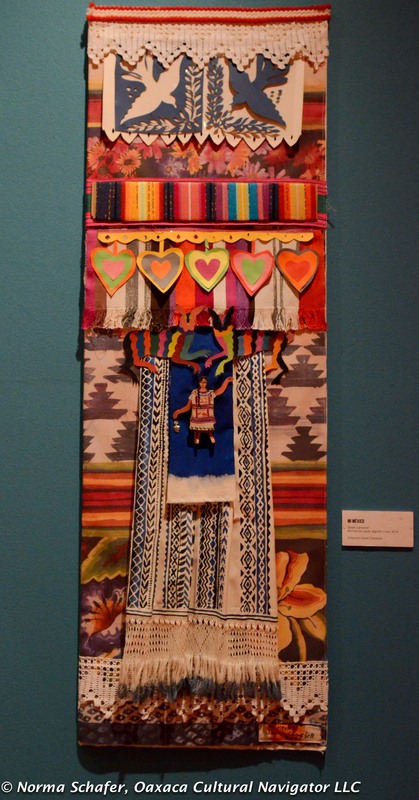 Hi Norma – Can I share this on my FB page – Living Textiles of Mexico? 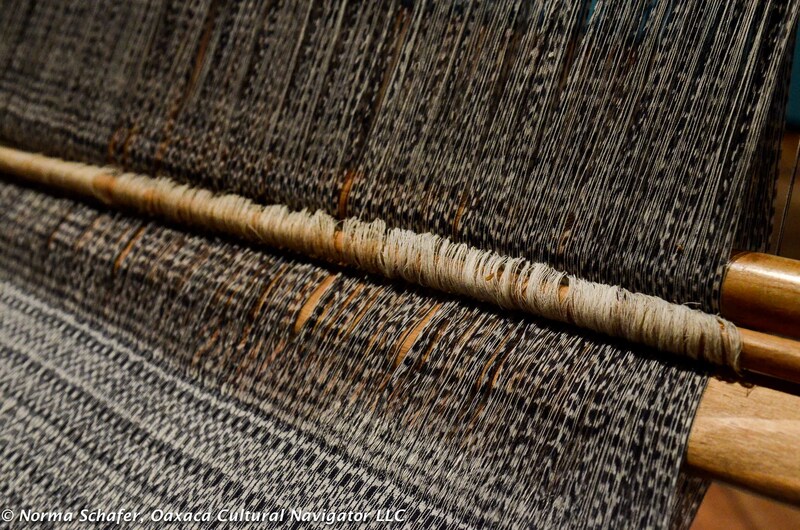 I have a lot of textiles fans following me and I want them to know about this….